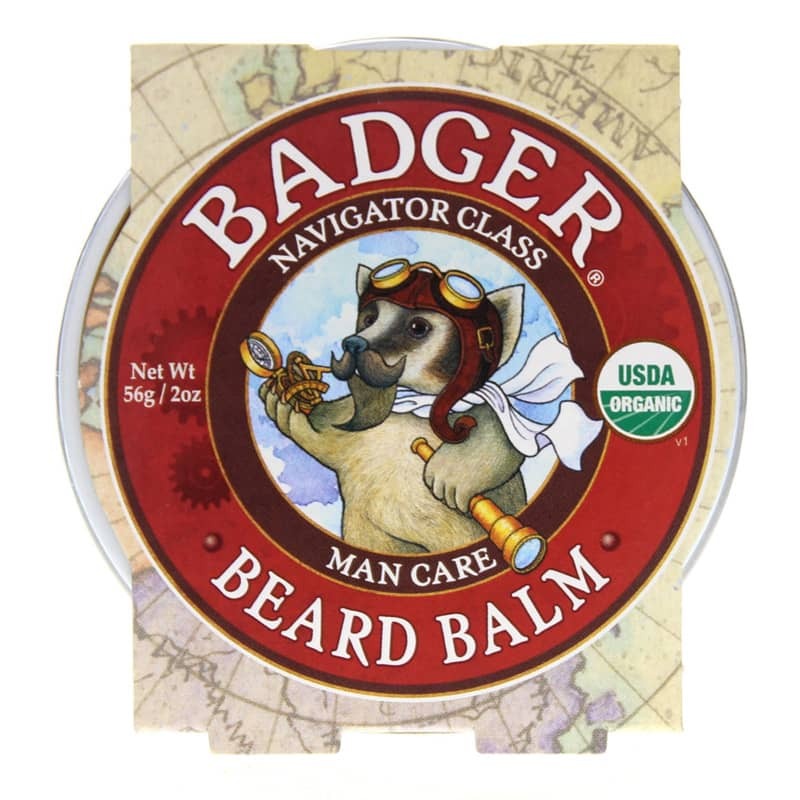 Man Care Beard Balm from Badger is a certified organic and all-natural beard balm that helps to condition your beard and act as a light styling aid. Ships today if you order in the next 14 hours 29 minutes. Badger Beard Balm is a naturally nourishing, daily leave-in conditioner and styling aid made with the finest ingredients. This quality product conditions, seals in moisture, keeps stray hairs in place, and acts as a light styling aid. A blend of Jojoba, Babassu and Baobab oils provides essential fatty acids plus vitamins A, D, E and F to deeply moisturize - without leaving a greasy after feel. Beeswax helps to seal in that moisture while providing good - but not stiff - hold, making hair appear thicker. When used daily, Beard Balm helps you maintain a beard that looks and feels healthy. 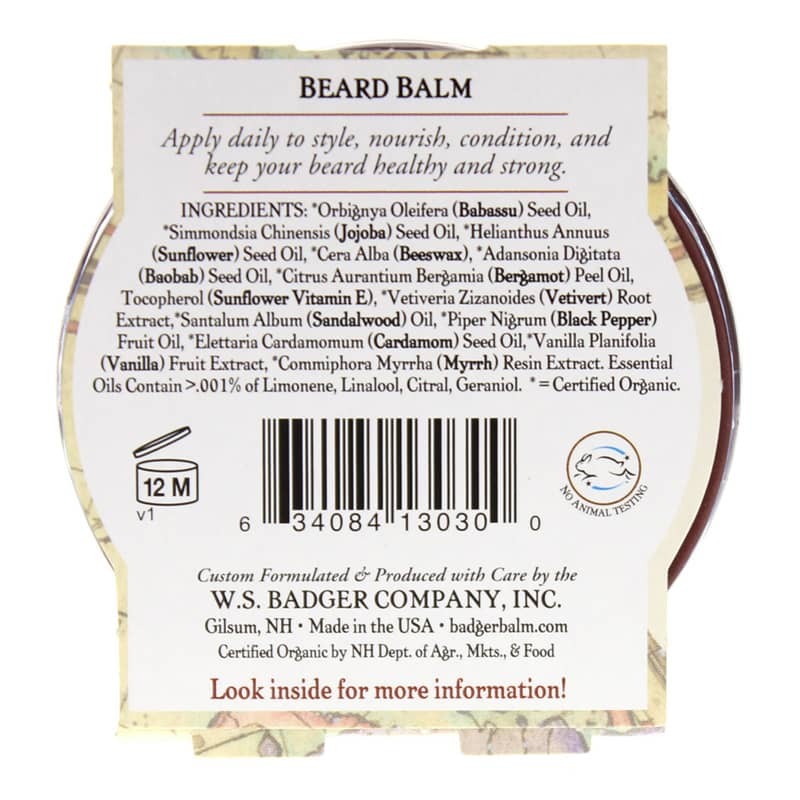 Give your beard the best care possible with Badger Beard Balm. *Orbignya Oleifera (Babassu) Seed Oil, *Simmondsia Chinensis (Jojoba) Seed Oil, *Helianthus Annuus (Sunflower) Seed Oil, *Cera Alba (Beeswax), *Adansonia Digitata (Baobab) Seed Oil, *Citrus Aurantium Bergamia (Bergamot) Peel Oil, Tocopherol (Sunflower Vitamin E), *Vetiveria Zizanoides (Vetivert) Root Extract,*Santalum Album (Sandalwood) Oil, *Piper Nigrum (Black Pepper) Fruit Oil, *Elettaria Cardamomum (Cardamom) Seed Oil,*Vanilla Planifolia (Vanilla) Fruit Extract, *Commiphora Myrrha (Myrrh) Resin Extract. For best results, apply balm to a completely dry beard. First, remove a bit of balm (about a pea size to dime size to start; more for longer beards) and place it in the palm of your hand. Lightly rub the balm between your palms and fingers. Next, work balm into beard, starting at the neck and moving upward underneath your beard, then reversing and working down from the top of your beard, along your cheek and chin area to the tip of your beard. Comb hair using our cherry wood Beard Comb (this helps to evenly distribute the balm while working it deep into hair and skin). Style as usual.